Aviation pioneer, inventor and civic leader, William E. Somerville rightfully deserves a prominent place in the history of Coal City and early American aviation. His many contributions were varied and widely recognized. Mr. Somerville was born in Scotland in 1870, where he attended Glasgow Technical College. He served as an apprentice at the Clyde Shipyards until he learned his trade as an electrician and marine engineer. He shipped out of Glasgow to America as Chief Engineer on the Anchor Line in 1892. After spending a summer as engineer on the Biddle family yacht, he left Philadelphia on a free-lancing tour of the United States and Canada. During this time he took such jobs as mining engineer, mechanic, electrical worker and even a short hitch in the U.S. Army. He then went to work for General Electric and traveled extensively for them as an electrician. In 1895, he came to Coal City to attend the funeral of his brother, who had been killed in a mining accident. While here, he was offered a position as City Electrical Engineer, which he accepted and remained at until 1900. Mr. Somerville, known as "Billie" to his admirers, soon became the talk of the town when he eloped to nearby Wilmington to marry Bertha Piagno, the only daughter of the Village "Queen," Constance. Elopement soon became the favorite way of surmounting the then-prevalent religious and ethnic barriers to this kind of a love-romance. After all, Bertha Piagno, the town's blond beauty, was a devout Roman Catholic and Somerville a Protestant. So we should also credit Mr. Somerville as being a romantic pioneer in helping to start our Great American Melting Pot to boil in this area. He soon induced a wire-rope mill to start a factory in Coal City. He became Superintendent of the new Macomber Whyte Company, and while there, he studied the methods and manufacturing processes and developed new wire rope making machinery. During this period in his life, Mr. Somerville was very civic minded and an untiring leader in local improvement and industrial growth. Ready to serve his community in any way, he was elected Mayor in 1905 and remained in office for eight years. Mr. Somerville was an accomplished musician, specializing on clarinet. He devoted considerable time to organizing and directing the Coal City Marine Band which became a leading musical group in this area for many years. He was also a member of the Pullman Marine Band and a guest soloist with John Sousa's famous band on several occassions. Mr. Somerville became deeply interested in aviation and turned his inventive mind toward that new interest in 1908. After developing a biplane and obtaining some patents for his aviation inventions, he resigned from the Macomber Whyte Company in 1911, to devote full time to his aviation developments. He leased 160 acres of land on the south side of town for a landing field and built a hanger and workshop. Later that year, he organized the Illinois Aero Construction Company with a number of local businessmen. William Somerville, President; Richard Seeley, Vice-President; A.J. Testa, Secretary. 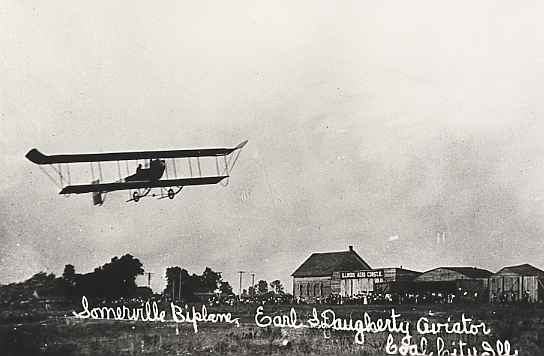 Somerville, standing, showing his biplane to visiting French dignitaries. The monoplane built by William E. Somerville. In December 1912, while Mr. Somerville was away on business, fire destroyed all the company buildings, five completed planes, the designs, patents, experimental models and a fortune in tools. The company was rebuilt and operated until mid-summer 1914. It was then when Mr. Somerville, discouraged by the slump in aviation, returned to the wire rope machine development. Entirely on his own, he established and maintained a shop in Coal City, where he invented and perfected wire rope making machinery that revolutionized the industry. Some time later he started the Wood-Web Porch Shade Company, having seen them made in Germany many years earlier. Mr. Somerville also built and owned the first automobile in Coal City. He later built and operated the Broadway Garage. During World War I, Mr. Somerville served as a captain in the Home Guard, where he trained young men for service before they departed for active duty. After gradually failing health, Mr. Somerville passed away September 25, 1950 at the age of 81. He is buried in Mount Olivet Cemetery in Wilmington. He was survived by his wife, one son, two daughters, and six grandchildren. William E. Somerville was generally recognized and beloved as Coal City's No. One Citizen. Company is visible in the background. It was located in the vicinity of Broadway and Spring Road.